This Forum is to discuss History and to annoy Fansy and Nowonmai by existing at all. London is usually seen as a one-river city, just big old Father Thames. The city breathes with the rise and fall of its tide, and for centuries the Thames has posed patiently for tourist drawings, etchings and photos. But what of London’s other rivers, the capital’s unseen waterways? Twenty-one tributaries flow to the Thames within the spread of Greater London, and that is just counting the main branches. Once tributaries, and tributaries of tributaries, are included the total moves beyond numbers into the realms of conjecture. Many of these rivers flow quietly above ground, in plain sight but generally unnoticed beyond their neighbourhoods. Their enticing names echo London’s rural past – the Crane, the Darent, the Mutton Brook, the Pool River – or carry a whiff of the exotic – the Ching, the Moselle, the Quaggy, the Silk Stream. These rivers go about their business forgotten in the background, but many inner London waterways have been deliberately hidden. London’s landscape was shaped by the hills and valleys these rivers created, but as the city grew they began to get in the way and were buried, bit by bit, under layers of streets and houses. London once needed all the rivers it could get: for drinking water, for harbours and wharves, for mills, for tanneries, and for sluicing away waste. The rivers were London’s sewage system long before any system was conceived, but even tiny medieval London was too much for any stream to cope with. The Walbrook, flowing through the heart of the City of London, was mostly paved over in the 1460s; it was considered a filthy nuisance choked with refuse. London’s origins are deep in the Walbrook, the river around which the Romans founded the city. The debris dug from the river – hoes and ploughshares, chisels and saws, scalpels and spatulas, the heads of forgotten gods and a collection of 48 human skulls tell the earliest London tales. As London began to grow at the end of the 18th century, and then to mushroom beyond reason during the 19th century, the rivers became a big problem. Floods, filth, stench and disease put off Georgian and Victorian house-buyers. In Mayfair, the Tyburn was tucked away under mews. In West Norwood, the Effra was buried deep under grids of new Victorian villas. The Fleet was legendarily filthy. Redesigned as a Venetian-style canal by Christopher Wren after the Fire of London, it was quickly overtaken by grim reality. Jonathan Swift, in 1710, wrote about the Fleet filled with “the sweepings from butchers’ stalls, dung, guts and blood.” A few years later Alexander Pope described how “Fleet-ditch with disemboguing streams / Rolls the large tribute of dead dogs to the Thames.” It is no surprise then that the lower Fleet was culverted in huge storm sewer tunnels where it has remained ever since. Yet before the river became more trouble than it was worth, it was a crucial route in as well as out. Everything from Welsh cheese to coals from Newcastle arrived at the Fleet wharves, and even the stones for Old St. Paul’s Cathedral were unloaded here. The rivers may be hidden but they are far from gone. It is very hard to stop a river from flowing, so they have merely been diverted into the sewer system, often as part of Joseph Bazalgette’s monumental tunnelling programme during the 1860s and 1870s. They can still be seen if you know where to look, flowing through culverts and under gratings. Sometimes they are hidden in plain sight. The Hampstead and Highgate Ponds are former reservoirs created by damming two streams that form the Fleet. Regent’s Park Lake was originally fed by the Tyburn, while the Serpentine was landscaped from the Westbourne in 1731 for the benefit of George II’s consort, Queen Caroline. Unfortunately the sewage problem eventually rendered both rivers unsuitable for ornamental ponds, and they were diverted away. They also shaped London’s hills and valleys, a landscape layered over but still visible. Mysteriously steep roads, such as Pentonville Rise, make sense when seen as the sides of the Fleet Valley. The sharp dip as Piccadilly passes Green Park shows us where the Tyburn once crossed the road. The Oval is oval because it was built into a bend in the Effra. Holborn Viaduct is a bridge with no river built on the site of an ancient Fleet crossing. From the viaduct the valley of the Fleet stretches away below, wide and deep, now occupied by Farringdon Street. Names also contain clues obvious only in retrospect. Kilburn is named after the upper reaches of the Westbourne, also responsible for Bayswater, and once crossed by the Knight’s Bridge. Wandsworth has its very own river, the Wandle. Peckham Rye means “village by the River Peck”. Streets retain the river names: Effra Road and Westbourne Green, or just simply Neckinger and Walbrook. Lost rivers really are everywhere, even in the places Londoners think they know intimately. The Tyburn runs directly beneath Buckingham Palace. The Walbrook is probably the most direct route into the Bank of England, running in a tunnel under its vaults. The Earl’s Sluice curves its way past Millwall football ground. The lost rivers link the familiar – the Royal Parks, Mayfair, the City, the South Bank – to places few visit – the back streets of Camberwell, Croydon, Earlsfield, Elephant and Castle, Gospel Oak, Kentish Town, Mitcham, Swiss Cottage, and West Norwood to name but a few. London’s rivers are invisible threads, binding London together under the surface while the city roars above. They were here long before people or buildings arrived. They are a hidden system for cutting through the layers on which London stands, and revealing the many places London used to be. Tom Bolton is a researcher and author, whose latest book London's Lost Rivers: A Walker's Guide reveals the unseen rivers that flow through London. The book is illustrated with photography by SF Said, whose images are on display at Maggs Bros. Ltd. as part of its current Jon Savage and SF Said exhibition, running until April 19. Nice article Svizz, thanks for posting. 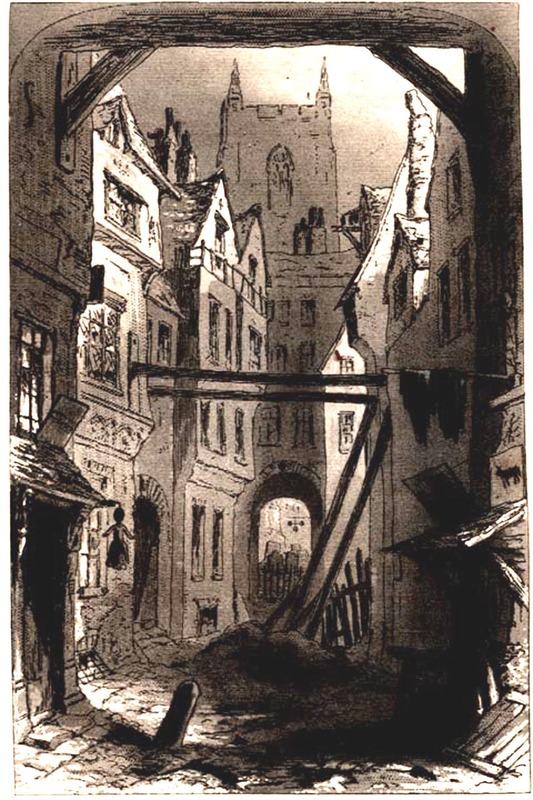 Ye olde rookeries of London are fascinating social history, places like Jacob's Island were the inspiration for Oliver Twist. One of London's old subterranean rivers, the Neckinger, spews into the Thames here. "...we support members' rights to privacy." Im glad its a real thing and not some NatGeo producer trying to stealthily hype some BS show about naked people looking for lost cities. Really interesting too.